eCommerce and online marketing change every day. New techniques are developed, new trends appear, and new tools are released. If you want to stay in-the-know, it’s important to follow the top eCommerce influencers. Twitter is one of the best places to learn from influential people. It’s a broadcast platform that influencers use to share links and useful information, and it’s easy to follow lots of people. Maybe too easy. Twitter is a powerful source of knowledge, but if you follow too many accounts, the onslaught of information will quickly overwhelm you. Instead of following everyone under the sun, it’s better to follow a curated list of people whose insights can have the largest impact on your business. Here is our list of the top eCommerce influencers on Twitter. By following these accounts, you’ll tap into the major news and trends of the eCommerce industry, and possibly learn tricks and skills that will create positive change for your store. 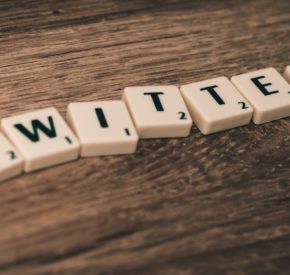 Whether you manage a massive brand or you’re new to the eCommerce world, you need to follow these Twitter accounts. We haven’t ranked them in any way, so don’t pay attention to the numbers. Follow them all or choose the ones that add the most value to you. Don’t see someone who should be on this list? Let us know in the comments! Steve Chou is a self-made eCommerce giant. He and his wife started an online store so she wouldn’t have to go back to work after having their first child. The store exploded in less than a year. Now, Chou runs a blog where he shares his practical, first-hand eCommerce advice. Youderian is the founder of eCommerceFuel, a private community for high six- and seven-figure store owners. He curates high-quality content that’s full valuable insights. He also knows a lot about shopping platforms, like Amazon and Google Shopping. Lütke is the founder and CEO of the massive eCommerce platform Shopify. He’s a developer by nature, so his thoughts are tech-focused, but that could add a bit of diversity to your Twitter feed. You never know what you might learn! If your store uses Shopify, this is a great source of information. Carroll would be a unique addition to your Twitter feed. She helps eCommerce stores step into international markets and often tweets about global eCommerce trends and how social and political changes affect the industry. Solomon is a customer service guru who shares his customer-centric eCommerce philosophy on Twitter. Follow him to learn about pleasing customers at a high level (especially millennials). Wittenstein is a user experience designer and strategist with a strong grasp of the latest eCommerce trends. He teaches how to create eCommerce experiences that align with your customers’ needs and preferences. Marks is a Magento Evangelist, which means he travels all over the world and talks about eCommerce and platforms. His Twitter feed is a great source of information about the people in the eCommerce community. It’s a lot of Magento, but not only Magento. Lazazzera is the founder of A Better Lemonade Stand, an eCommerce blog filled with resources and guides on all types of eCommerce topics. He also reviews tools, so you can get an idea if they fit your needs before you buy. He has built several eCommerce stores himself, so his advice comes from experience. Johnson is the president of Loyalty 360, one of the largest associations of customer loyalty professionals. His tweets center around helping big brands keep their customers buying through relationships and loyalty programs. Garcia is a retail reporter at MarketWatch. She covers big companies and their campaigns to drive sales and improve customer engagement. Hutt is one of the most popular eCommerce influencers, especially on social media. He shares the strategies he used to hit $50 million in sales with his first eCommerce business. He’s a Shopify expert, and often evangelizes that platform, but he shares a lot of universal strategies for eCommerce shops and professionals. Peep Laja is the biggest name in conversion optimization and the founder of ConversionXL. He offers powerful strategies to help you improve conversions on your eCommerce site. If you have decent sales now, his advice can help you supercharge your conversions and generate big money. As the editor-in-chief for eCommerce platform BigCommerce, Wallace tweets a lot about the latest trends in online commerce. Her tweet feed is obviously somewhat BigCommerce heavy, but she includes a lot of more general eCommerce thoughts and learnings, as well. She also the co-founder of a pillow manufacturer, so she tweets about her direct experience with eCommerce, too. Michelli is a best-selling author who has covered the customer experience of big brands like Zappos and Starbucks. He focuses on decreasing churn by building strong relationships with your customers. Most of his tweets are centered around large retailers. Gilbreath is SVP of marketing at ScaleFactor, a bookkeeping app for small businesses. He tweets about data-driven marketing and building long relationships with your customers. White is a prolific author of email marketing topics and the Research Director of Litmus. He helps businesses of all sizes apply email marketing best practices. Smith is the founder of one of our favorite email repositories, Really Good Emails. He’s a talented email designer with experience working with many of the world’s biggest startups and often tweets about the state of email in general. Wigder is the Chief Global Content Officer at Shoptalk, a retail event attended by thousands of retailers and brands from around the world. She has extensive knowledge of eCommerce trends and business models her tweets will keepyou up-to-date with new retail technologies. Campbell is an eCommerce consultant and founder of eCommerce growth marketing firm 2x Media. A frequent contributor to many of the top eCommerce blogs, he often tweets about the latest trends in online retail and especially about the market forces shaping global eCommerce. Brawner is the Chief Fixer at Brand Growth Experts, the host of the Ecommerce Influence podcast, an email marketing consultant, and a popular speaker. He’s a strong advocate of email marketing. His podcast is a mix of actionable how-to and high-level theory. Thea is the host of the Shopify Masters podcast. He discusses literally everything about eCommerce, from generating ideas to packaging products to interacting with your customers. And of course, there’s plenty of marketing content. He interviews successful eCommerce entrepreneurs every week to break down their methods and insight. Del Rey is the senior editor for Recode covering eCommerce, Amazon, and payment companies. His content touches the very top of the online retail industry, which could give you ideas how to steer your company. Roggio is the Director of Marketing and eCommerce of a farm supply brand. His tweets cover a wide range of eCommerce topics. He’s also extremely prolific—you’ll find his writing all over the place. Obviously, that’s a lot of people to follow. If you already follow people on Twitter, it’s easy to fill your Twitter feed with so much content that you couldn’t possibly keep up. One of the best ways to organize your Twitter so it’s easier to manage is by using topical lists. Twitter lists are an easy to use feature that let you organize the people you follow into groups, so you can see tweets from a smaller number of accounts at once. You can organize your lists in any way you want, such as creating lists about specific topics. You actually don’t even have to follow someone to add them to a list! Give your list a name and description and choose your privacy setting. Public lists will be available from your Twitter profile and anyone on Twitter can follow them. Private lists will only be accessible by you. 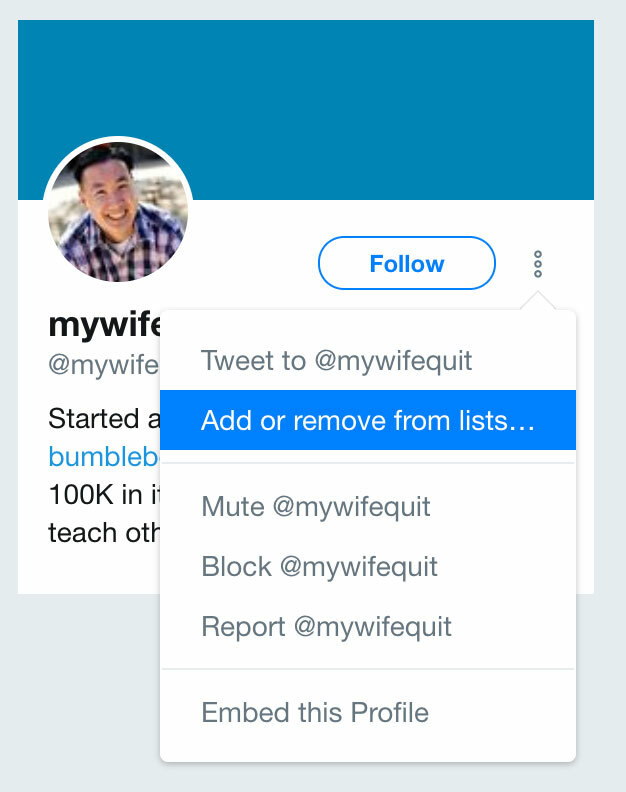 Once you’ve stocked a list with accounts, you can visit the list to view only the tweets from people on that list, excluding everyone else you follow. This way you can browse your influencers’ content without wading through everything else. You can add or remove anyone from your lists by clicking the “three dots” on their profile. If you set up multiple lists, we recommend checking out TweetDeck. It uses columns to organize different types of Twitter content so you can view multiple accounts, lists, and hashtags all at once without becoming overwhelmed by the noise. Want to follow everyone mentioned in this post? We created a public eCommerce influencer list that has everyone above already on it. You can follow it here. 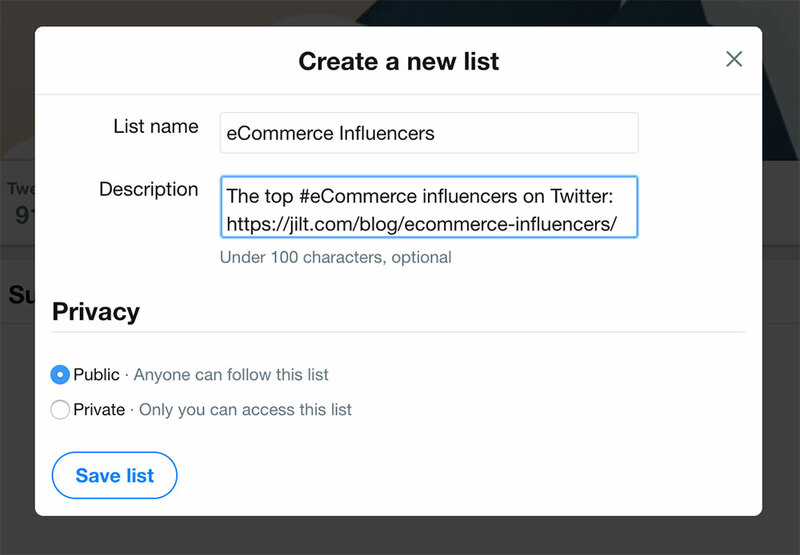 Following these the eCommerce influencers on this list is a great way to level up your eCommerce knowledge, but if you want to level up your relationship with influential people in the eCommerce space, here are some steps for doing that. These tips work for approaching influencers in any space, not just the people on this list. The most important step is to find the right people to target. You want to find people who have a decent following, but not so big they’re unapproachable. They should be experts in your industry with a history of giving back (speaking, attending conferences, etc.). Most importantly, limit yourself to people who routinely engage with their fans. Next, create a list for your influencers. You may wan to keep it private so they don’t get a notification, though you obviously don’t have to. Add each influencer to the list. This will let you browse your influencer’s tweets without sifting through all the other Twitter spam. As you engage softly with their content, get a feel for what they like to share and comment on. Take some basic notes if it helps. Do they prefer actionable content or theory? Do they like new tools and resources? Do they like controversial topics? Next, participate in whatever they do. Sign up for their email list. Join their webinars. Participate in their Twitter chats. Show up any time your influencers deliberately try to engage with people. Once you’ve made yourself a part of the influencers’ communities, it’s time to reach out directly. To break the ice, it’s best to offer to help in some way. For example, you might offer some advice for an article they wrote or to join their podcast as an expert guest. At some point, you’ll want to move the conversation off Twitter on to a more personal medium: email. Email gives you more room for complex thoughts and more tools to format text (lists, links, etc.). Ask if it’s alright if you notify them when you produce a new piece of content, or if they mind if you bounce an idea off them from time to time. Once you develop a relationship with the influencers you like, it’s important to continue engaging on Twitter. You don’t have to email them every day (in fact, you probably shouldn’t! ), but it’s smart to keep yourself top of mind. The best way to interact often without being creepy is to continually offer help, even just by resharing their content or tweets. Our list of the top eCommerce influencers isn’t exhaustive by any means, but it’s a good place to get started. Study their tweets, read their blogs, consume their wisdom, and leverage their insights to empower your eCommerce store. Oh, and don’t forget to engage with those influencers. Popular influencers may have hundreds of thousands of followers, but that doesn’t mean they won’t interact with you on Twitter. This is especially true if you have a unique question or a valuable comment. Beka is the head of product at Jilt. She works on app improvements, integration plugins, helping merchants improve recovery campaigns, and shares tutorials on reducing abandonment or improving recovery on our blog. Thanks Beka! Super proud to be on this list! © 2019 Jilt - All Rights Reserved.